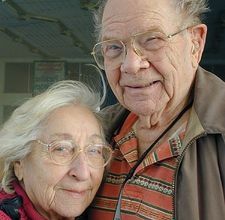 June 15, 2011 would be my folk's 70th anniversary if Dad was still living; he died 65.5 years into their love relationship. But, to me, it's still their 70th anniversary today. In 2021, it would have been their 80th, etc. June 15th will always be a magical day for me as it was a magical day for them. Mom woke up fairly chipper today so we took the opportunity to hit the road! Mom, Carina, and I had a wonderful day shopping down at Tyson's Corner. We went looking for some new gowns and robes for Mom, but couldn't find the robes we needed so left empty handed. But, we did what any good shoppers would do - we had lunch! Carina and I settled Mom into Legal Seafoods where I quizzed the chef about the sodium content of the gazpacho (are you listening Linda?!). When he couldn't come up with any hard fast numbers, I did the next logical thing and called John to check from his computer. 5 minutes later, and we still didn't have the answer so I did the next logical thing - I gave Mom the gazpacho. There are some times when it's just worth it to take the risk. Mom loves gazpacho so I just told her that she had to drink more water when we got home (she didn't) but, all in all, the time out of the house with Mom is worth what the setback will be tomorrow - she'll probably wake up tomorrow confused, get a bit centered around 11 am and then drift back off. And, Carina and I will be there to catch her and center her back as much as we can. This aging stuff is for the birds. It's a tough road to follow and even tougher to try and lead. I want so much for Mom to be comfortable and happy and, gosh, I hope she is. She is my treasure and will always be. I'm so lucky to have had the parents that I did; so few are as lucky. I've rarely had a chance to really miss my Dad as I "married" Mom the day after Dad died. But there are times when I still feel him around me. I particularly feel him sometimes when I look in John's eyes and see the kindness there. John looks at me with the same love and respect that my Dad had for my Mom. great post, your parents were a nice looking couple. Thanks, Lisa. My parents were unlike any other - they truly were all about family and loved their children like none other. I'm so very lucky to have been raised by these two wonderful lovers. One of the hardest things for me as a child is buying a card for my mother to commemorate my parents wedding anniversary. I don't know why that is but I just struggle with giving my mother a card that is meant for two. I know she does not care what the card says - just that I thought of her, them. But it's still hard and my Dad is only gone 8 years. I agree, Shari. I always make sure Mom knows when the anniversary is coming up and we talk about Dad a lot as it approaches. It is very difficult though to celebrate a party of one when it was supposed to be a party of two.